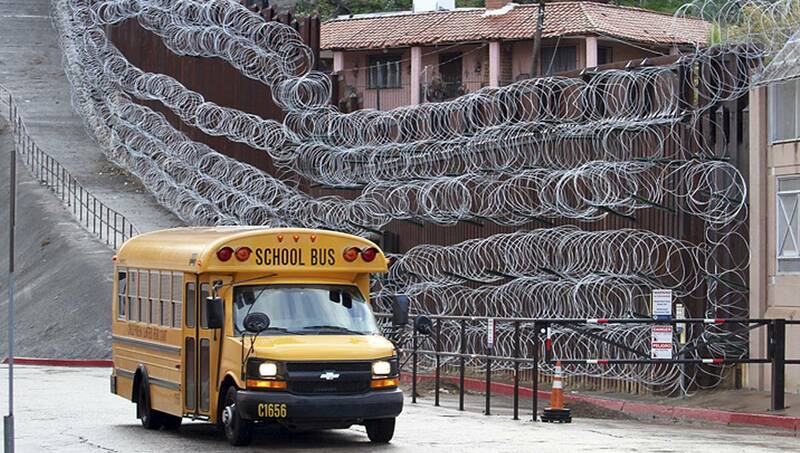 Photo: In this Monday, Feb. 4, 2019 photo, a school bus rolls past the concertina wire-covered fence at East International and Nelson Streets in downtown Nogales, Ariz.
Nogales, Feb 9 : A U.S. Customs and Border Protection officer shot and wounded a driver who was trying to enter Mexico at a crossing in Arizona, the agency said Friday. The mayor of Nogales, Arizona, told a newspaper Thursday night that the man was killed, but CBP spokeswoman Teresa Small told The Associated Press Friday the man had not died. A CBP statement said he was wounded and taken to a hospital in Mexico. His condition and further details on the incident were not provided. Nogales Mayor Arturo Garino told the Arizona Daily Star that the shooting occurred after the driver refused to stop and tried to run over the CBP officer. A woman who answered the phone at Garino’s office said the mayor was unavailable, and there was no more information about the shooting. The shooting occurred in the border city where U.S. troops recently installed razor wire along portions of an 18-foot border wall, in some spots reaching nearly ground level. The Nogales City Council condemned the wire and demanded that it be removed over safety concerns for children and pets. Residents and shopkeepers complain that it makes the community look like a war zone.